Yesterday being my 31st birthday, I made sure that in between Craig’s two big birthday surprises–a trip to MoMA for the Tim Burton exhibit which, unfortunately, was sold out (but we still had fun seeing iconic works of modern art) and a dinner at a surprise venue that I already gave away in the title of this post–we could stop for a snack at Cafe Sabarsky. Craig gladly obliged. 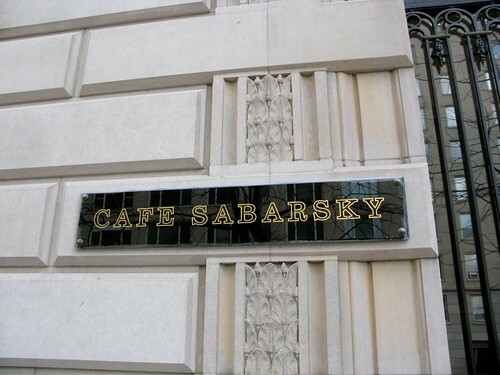 What is it about Cafe Sabarsky that I love so much? The building itself is a historic mansion, built in 1914 and occupied, for a time by the Vanderbilts, it’s now owned by Ronald Lauder of the Estée Lauder family. 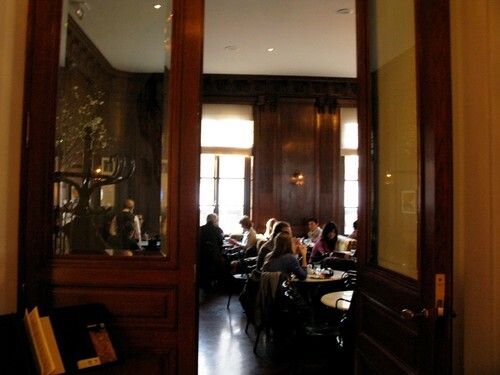 Inside there’s museum, the Neue Gallery, and–in what I think was formerly the mansion’s ballroom–Cafe Sabarsky, an authentic Austrian Cafe. 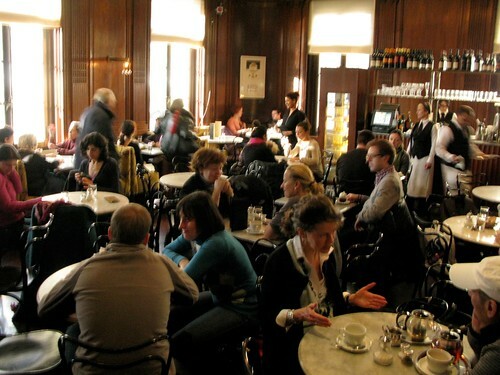 Walking into Cafe Sabarsky (sometimes there’s a little line), you feel like you’re walking into an Austrian cafe, frozen in time. 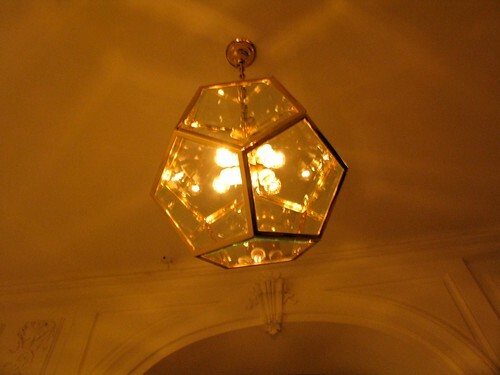 It’s these architectural/design touches that create such a sense of old world sophistication, of European-inflected turn of the century New York glamour. 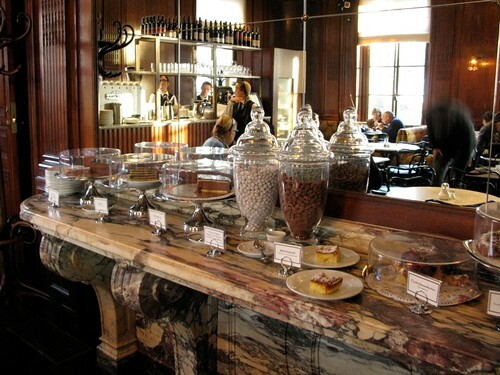 Pastries and coffee are the two other reasons I love Cafe Sabarsky. The coffee is eclectically Austrian; Craig and I both ordered an Einspänner, a double espresso with whipped cream in a glass. What’s great about this is that it’s creamy and decadent, but not at all sweet. 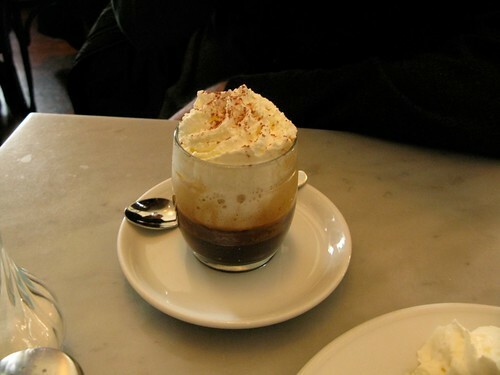 You spoon the whipped cream into your mouth and create a little pathway for the coffee for your first sip. 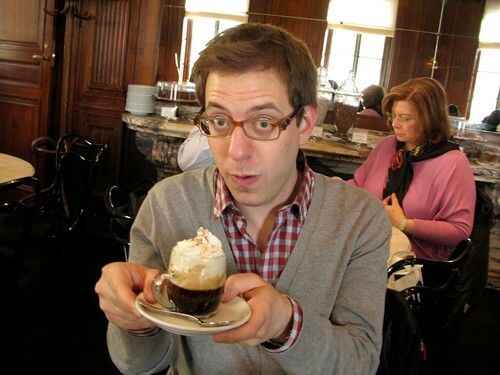 As you drink, the whipped cream melts and you’re left with something frothy and delightful. The linzertorte embodies everything I love in a dessert: something fruity (in this case jam), and a sweet pastry (in this case, one flecked with nuts and topped with pistachios). 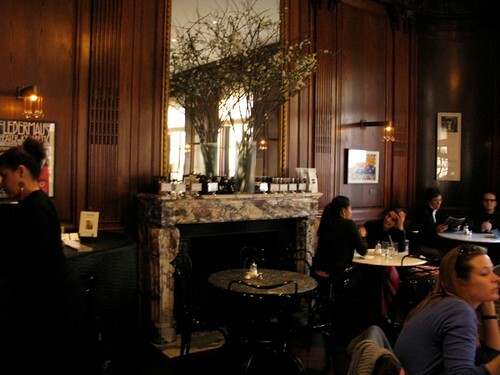 At Cafe Sabarsky, it’s pretty divine. 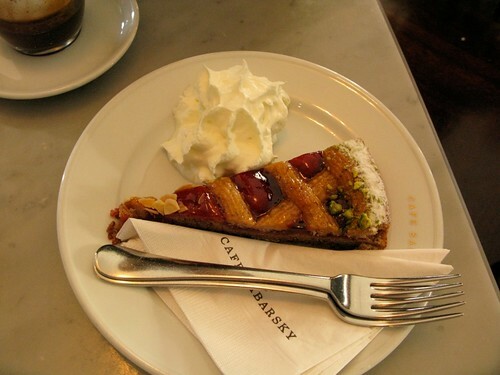 So take note New York visitors (and New Yorkers who’ve never been): a great New York day is a visit to a museum (the Met is just a few blocks south) and a coffee and pastry at Cafe Sabarsky. New York days don’t get much better than that, unless you throw in a Broadway show. That said, my day did get better a few hours later when Craig put us in a cab (only after I bought a peeler at Williams Sonoma; I needed a peeler, in case you were curious) and told the driver, “24th and 9th Ave.” Possessing the encyclopedic knowledge I have of New York restaurants, it didn’t take long to figure out where we were going. Especially since the night before, Craig abruptly cancelled our pizza plans. We were going to Company; and sure enough, upon arrival, I was right! Company is the relatively new pizza joint from Jim Lahey, the genius bread baker behind the No-Knead bread. 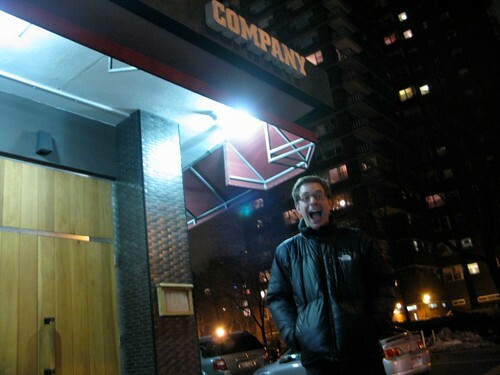 I’d been meaning to go to Company since it opened, but hadn’t made it; now, I was finally there and not only that, our good friends Mark and Diana were there too to help me celebrate. 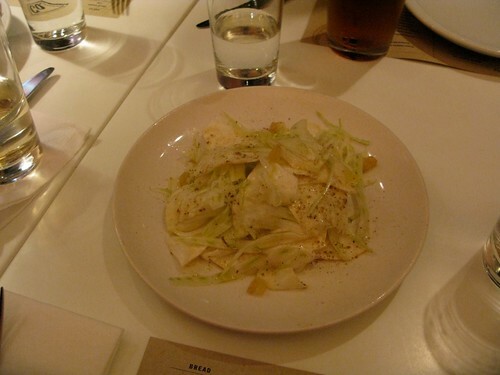 The salads were nice (though not as accomplished as the salads at Franny’s: see here, for evidence). 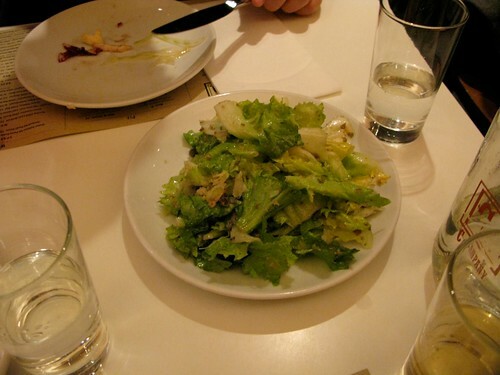 Still, no one goes for to Company for salad, they go for pizza and on that front, they hit it out of the park. I find it curious that Sam Sifton, in the New York Times, declared Motorino’s pizza the best in New York in this week’s paper. I’ve been to Motorino twice and as much as I enjoy their pizza–I particularly like the crust–I find their pizzas, as a whole, underwhelming. 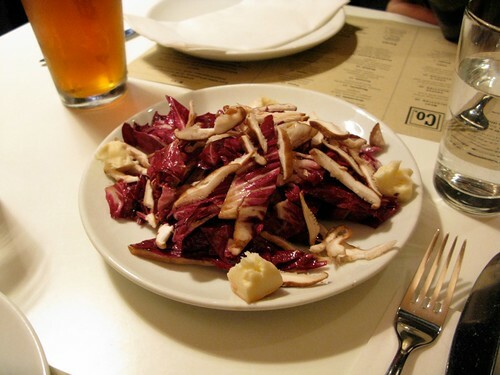 The toppings–even the famous Brussels sprouts pizza–almost seem like an afterthought. 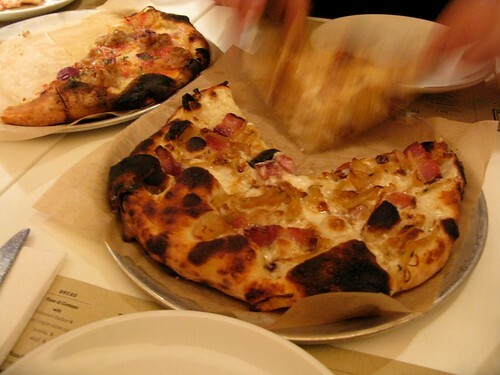 At Company, on the other hand, crust and topping come together as a glorious whole; the crust is accomplished and the toppings are truly memorable. In life, there are two kinds of meatballs: the hard, chewy ones doused in tomato sauce that you get on a hero at your local Italian joint, and then there are chef meatballs. I’ve had chef meatballs at CraftBar and a few other places and they are notable for being soft and pillowy, almost like a meaty cloud. That’s what these meatballs were like; they were so delicate, so subtle in their meatballiness they made me believe that pizza itself, in its natural state, is part animal. I would definitely order this pizza again. As any cook knows, spinach wilts when you cook it. What’s brilliant about this pie is that the spinach on top gets charred from the oven while the spinach on the bottom wilts into submission. 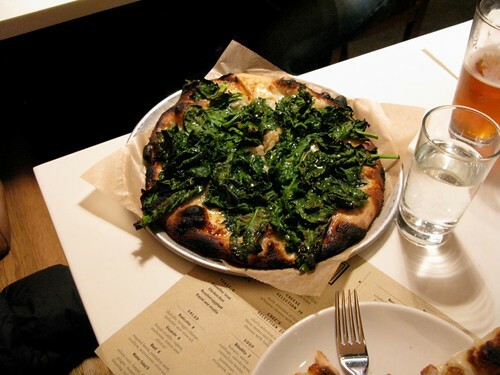 What you end up with is a pizza unlike any pizza you’ve had before, a pizza for the ages. Take that, Motorino! 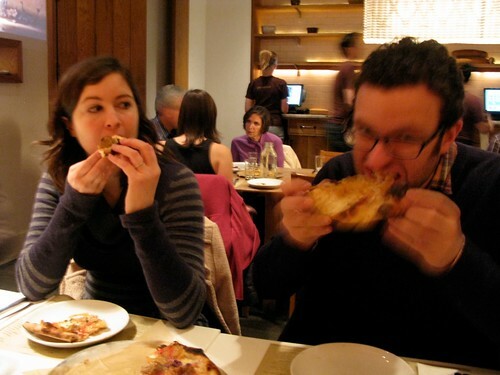 After all that pizza, you might wonder: how could you eat another bite? But as anyone who knows me knows, I can’t let a birthday end without dessert. (Actually: I can’t let a meal end without dessert.) 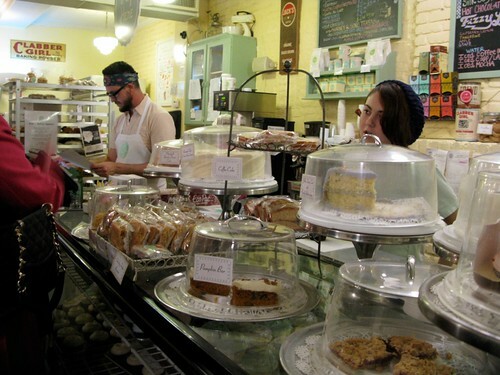 Instead of trying the desserts on the menu at Company (which I’d heard were just so-so), we walked a few blocks south to another beloved New York venue: Billy’s Bakery. And so it was that my 31st birthday ended. Here’s hoping this next year of my life is one part Estée Lauder mansion, one part spinach pizza and two parts cupcake. Make that three parts cupcake. 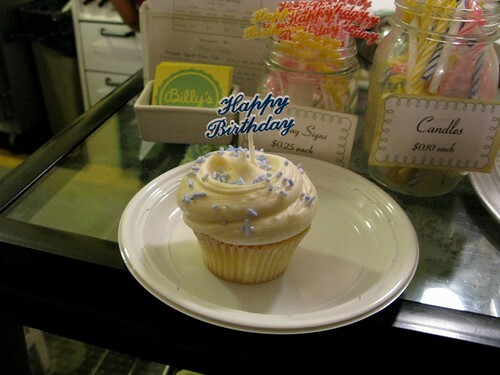 You can never have too much cupcake in your 31st year.